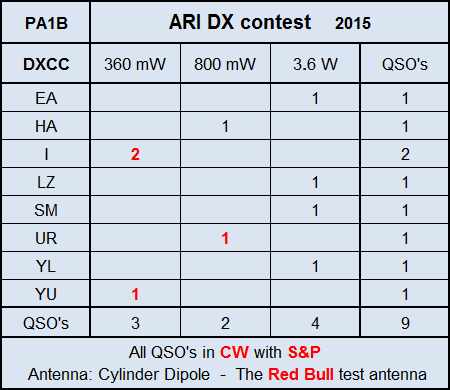 When I putted the Red Bull antenna into use, during the ARI DX 2015, I was aware of the controversial nature of short antennas. But I had absolutely NO doubt about this short antenna, with it's "wingspan" of just 12 inch. I was convinced that I could make QSO's with QRP or even QRPp from the shack. 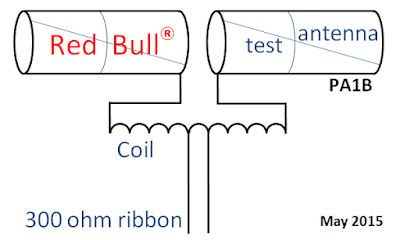 I was curious, whether the Red Bull antenna could be used on 14 MHz, although it was tuned at 26 MHz, in stead of 14 MHz. I clamped the PVC tube of the antenna between the bookshelf and connected a 300 ohm twin-lead between the symmetrical tuner and the coil of the antenna. The coil had 14 turns on a 40 mm coil former. 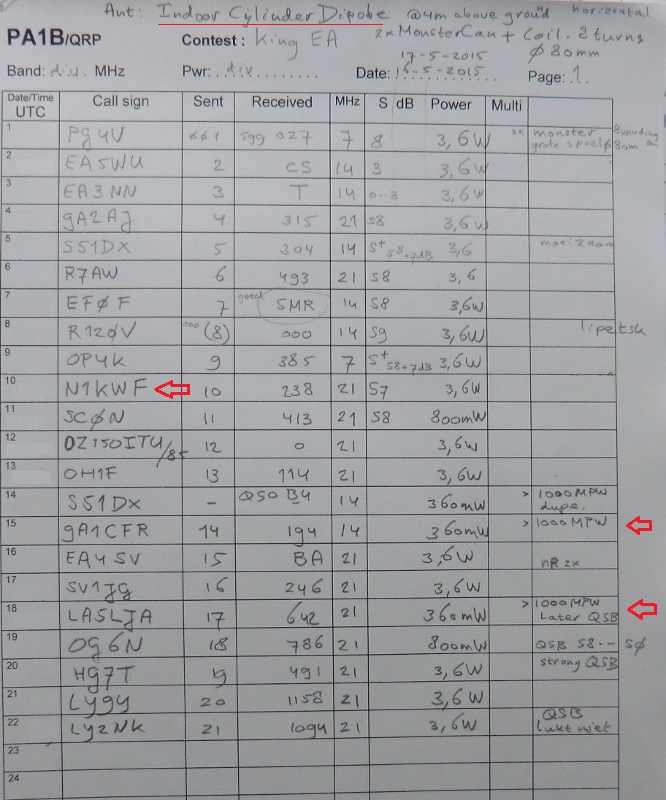 I did not bother to change the coil to lower the operating frequency, which was 26 MHz and thus much higher than 14 MHz, on which I would operate. The 300 ohm ribbon is is equipped with two alligator clips, which are connected to two connection points on the coil one turn apart. The tuning runs smoothly. It's very easy to get a accurate SWR of 1:1 So I could transmit with the antenna. I only tried 14 MHz, because that was, where the action was and I wanted to make QSO's immediately. 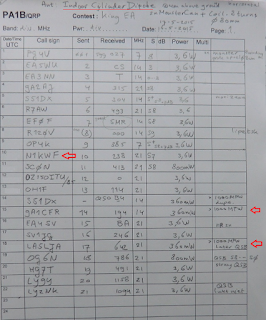 I did not try 21 MHz or 28 MHz.. I convinced myself with 360 milliwatt, with the antenna indoor, at a height of 4 meter above the ground. Is it not amazing. The first QSO that I made with this 12 inch antenna, was a more than 1000 Miles per Watt QSO. After adjusting the SWR, I heard the station II6T. I could easily make a QSO, using a power of just 360 milliwatt. I tried to work them, earlier in the contest, on the damaged inverted V. But they could not copy my RST on the cracking inverted V.
I am very pleased, with this first QSO on the Red Bull antenna. Later I realized that this QSO is a more than 1000 Miles per Watt QSO. 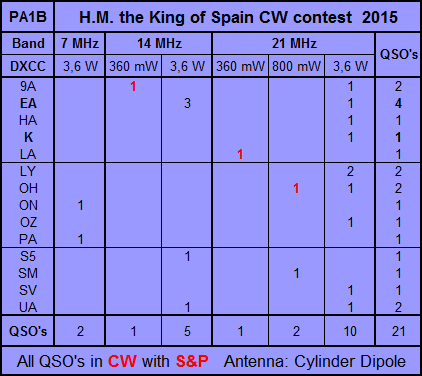 With 800 mW I managed to make a QSO with HA and a QSO with UR. Further I made a QSO with 360 mW with an other station from Italy. IK0YVV copied my call immediately, when I answered his CQ. His signal was strong, it was over S9. There a large difference between wire antennas, like the half wave dipole or inverted V and the short Cylinder dipole. The signals that are received on this short antenna, are much weaker. But also the short antenna picks up less noise. I noticed that it takes some time to got used to the weaker signals. 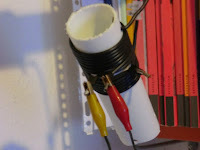 The next step is building the same antenna with larger cans and a larger coil former, so the antenna will resonate at 14 MHz and therefor has a good efficiency. 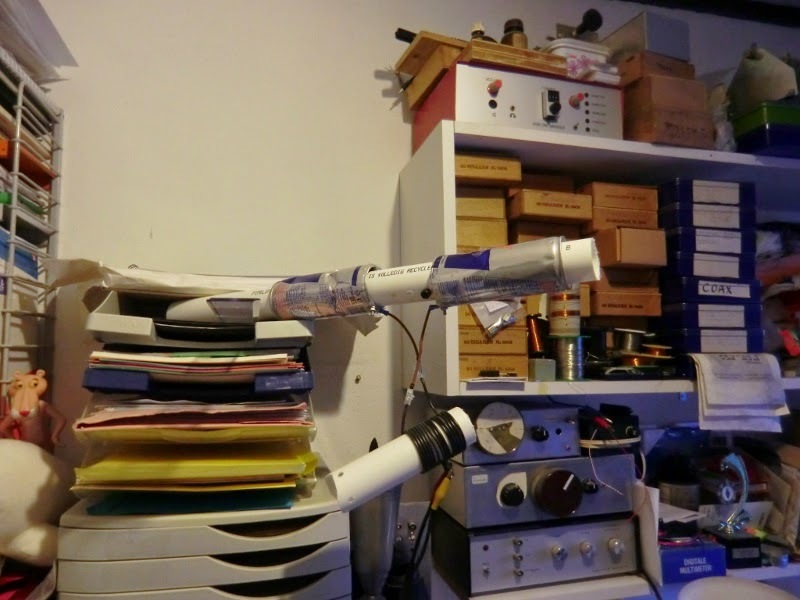 Test the antenna on 28 MHz. This frequency is near the actual resonance frequency. has no hand effect on the cable. The antenna lay around in the shack. Was it properly tuned to the operating frequency? NO. But I am very happy with the fact that the cylinder dipole is NOT critical in tuning and that the SWR is easily to adjust. Bert, PA1B, a fabriqué un dipôle cylindrique en remplacement de son antenne défectueuse pour achever un contact QRPp rendu difficile par cette dernière. Résultat ? 1000miles par Watt au premier QSO. This a a catchy one liner, I could NOT resist, LOL. Please notice that the Cylinder dipole is NOT a joke, but a very short, but working antenna. 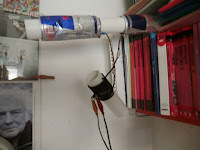 A few months ago I built an experimental cylinder dipole with two Red Bull cans and a coil, that works as an impedance transformer, to test the properties of symmetrical feeding. By using symmetrical feeding, the cable doesn't radiate and the cable has no hand effect. The ribbon of my inverted V is damaged by the wind. I wanted to make a few nice QSO's in the ARI DX contest, but I was very disappointed by the inverted V. The SWR is constantly changing, even with the slightest bit of wind. The inverted V cracks when the ribbon moves, both on receive and transmit. I tried to make a QSO with II6T with 360 mW on the damaged inverted. The operator repeated my call immediately correct, but because of the cracking twin lead, my exchange 001 was not received in Italy. Even when I increased my power to 3.6 W, the cracking twin lead spoiled the fun. 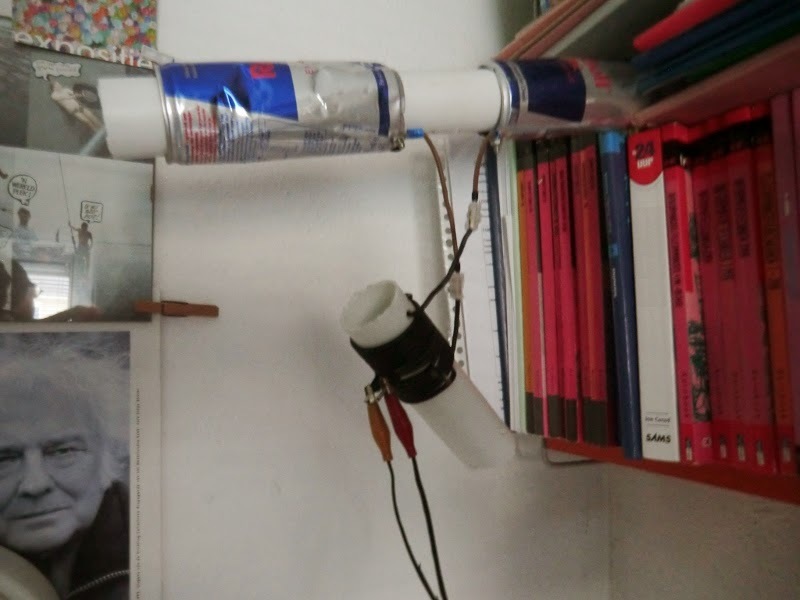 Then I decided to try to use the Red Bull antenna. I clamped it between my book shelf. I connected a 300 ohm twin lead between the coil of the antenna and the symmetrical tuner. I matched the antenna with the symmetrical tuner for the lowest SWR. 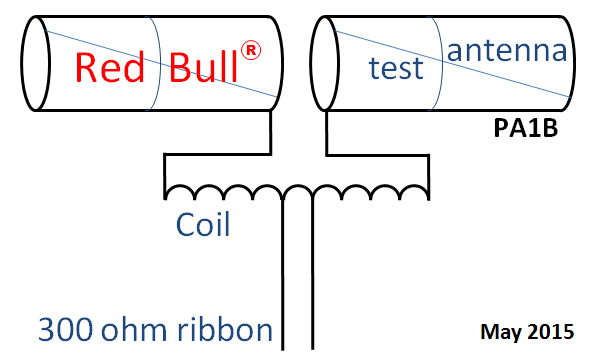 The resonance frequency of the cans and the coil lays between 21 to 28 MHz, but the Red Bull antenna could be matched easily to 14 MHz, using a symmetrical tuner. After a while I heard II6T again, but now on the cylinder dipole, I answered their CQ with 360 mW. I got an immediate response and the QSO was easily made. WOW. In total I made about 10 QSO's on the Red Bull antenne, with a power of 360 mW to 3,6 watts in the rest of the ARI DX contest. 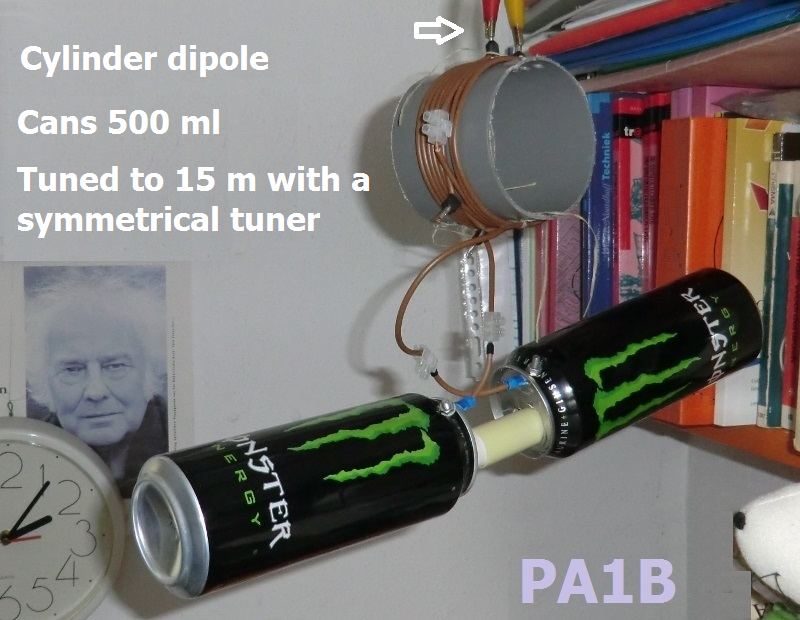 Later I realized, that the first QSO with the cylinder dipole is good for 1000 Miles per Watt. hi. The magic of the Cylinder Dipole lays in the large capacity of the the two cylinders. The coil and the capacity of the cans determine the resonance frequency of the antenna. The coil acts as impedance transformer. The 300 ohm ribbon is connected to 2 points on the coil that are 1 turn apart. The coil it self has 14 turns. The twin lead is connected to two connectors one turn apart, at the middle of the coil, to feed the dipole symmetrically. I chose for the symmetrical construction to avoid hand effect of the ribbon. 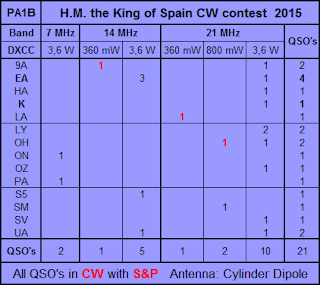 In his informative Blog, Roger G3XBM wrote about aircraft scattering of signals on 6 m.
I had the pleasure of making an analysis of the WSPR spots reported by Roger. In WSPR the drift is measured over a period of 1 minute, so the drift is given in Hz per minute. Recently I included Drift in my Excel spread sheet that I use to make an analysis. The value in the table, such as -4, is a spot with a drift of -4 Hz per minute. Positive drift means that the radio path is getting shorter and negative is longer. The signals of M0MVB show spots with a drift of -2 and 3 Hz per minute. It is possible, that there is a flight paths involved in the spots with -2 and an other path with the spots of 3 Hz per minute. 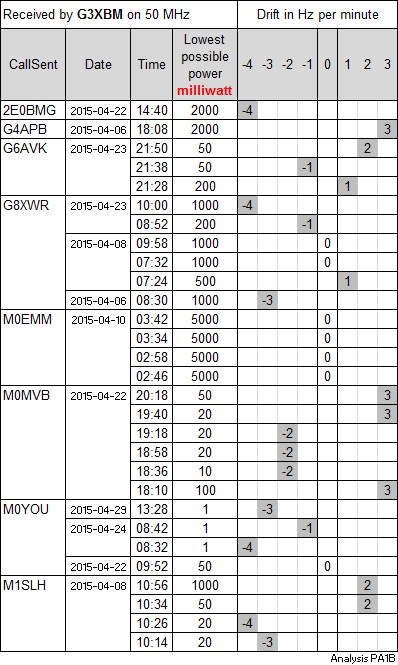 The scattered signals with drift, sent by M0YOU are very strong, with a lowest possible power of 1 mW. The spot with no drift (0 Hz per minute) has a lowest possible power of 50 mW, thus is 17 dB weaker. The signals of M0EMM show no drift. So it's possible that there is no airplane scatter here, but an other form of propagation, such as difraction. Notice that all these spots are made within one hour. This evening I took some time to make an analysis of a number of spots on 6 meter. I took the most interesting spots for airplane scatter. I hope you like it and can place it in your blog. Positive drift means the path is becoming shorter. I just saw that the spots of M0YOU with scatter, are much stronger than the spot without scatter. The lower the lowest possible power, the stronger the signal. A lowest possible power of 1 mW is 17 dB stronger than 50 mW. hi. I left in the spots of M0EMM, to show that there is no Doppler and the signals are not that strong.